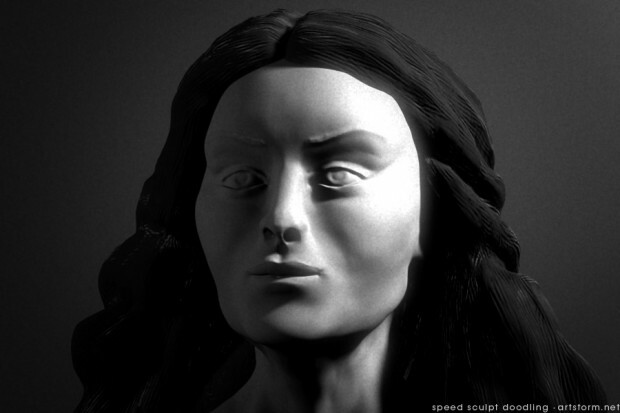 A 3 hour speed sculpting. I haven’t used ZBrush for a while, so I doodled around in it for a few hours today, to get the groove back. The image below is the result of a couple of zspheres and then just playing around, sculpting out the basics for the female form. I wasn’t going for accuracy or realism this time, just trying to get the shapes down and having some fun with it. I could probably go on for a few more hours, keeping on refining and improving on her looks, but that would take the speed out of speed doodling. When I ended my sculpting session I exported her out of ZBrush together with a displacement map, and made a quick and dirty render in LightWave 3D, which is the render above, trying to capture at least some mood. Actually, I think it’s pretty healthy to do a doodle now and then, to give myself some time to explore some new tools and techniques in my applications which I might not dare trying out when I do real projects. I’ll probably try do this somewhat regular to work on my speed and nail down better techniques.